occur due to any of the following conditions. 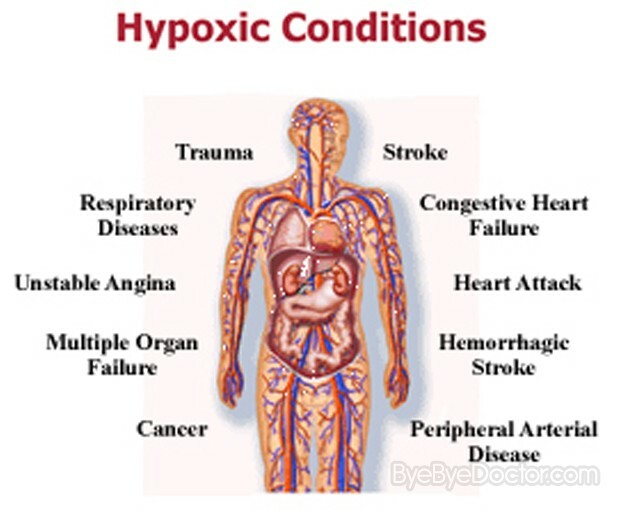 In this type of hypoxia the partial pressure of oxygen is reduced in arterial blood, which can be seen in high altitude, venous arterial shunt, pulmonary fibrosis, pulmonary edema, emphysema, pneumothorax, respiratory muscle paralysis, obstruction to the respiratory passage and depression of respiratory center. In arterial hypoxia the rate of blood flow and oxygen carrying capacity are normal. Cyanosis is present in this type. Hypoxia can occur when the rate of blood flow to the tissues is reduced as in cardiac failure (pump failure) and aneurysm of the aorta. In this type, the PO2 and oxygen carrying capacity are normal. The presence of cyanosis is also characteristic of this hypoxia. Anemic hypoxia is caused by reduced hemoglobin content or hemoglobin present as COHb or formation of methemoglobin (Fe++ in Hb is oxidised to Fe+++). The PO2 in the arterial blood and the rate of blood flow to the tissues are normal. Since the quantity of Hb available is lower than normal, cyanosis does not occur in this type of hypoxia. When respiratory enzymes like cytochrome oxidases are inactivated by cyanide, the oxygen that is delivered to the tissues cannot be utilised and hence hypoxia results. In high altitude the barometric pressure is reduced, but not the composition of gases in the atmosphere. As one climbs the mountains, the partial pressure of oxygen is decreased proportionate to the ascent. The reduction in the arterial blood oxygen partial pressure, occurs in hypoxic hypoxia. At 12000 feet height, the barometric pressure is reduced to 380 mmHg and alveolar PO2 decreases to 60 mmHg. If the exposure to this altitude is sudden, as occurs in loss of cabin pressure in an aircraft, acute hypoxia can result. The effects of acute hypoxia are due to hypoxic effects on the medullary neurons. The symptoms like disorientation, euphoric states similar to alcohol drinking, poor judgment, mental confusion, headache, palpitation and dyspnea are observed in the affected subjects.